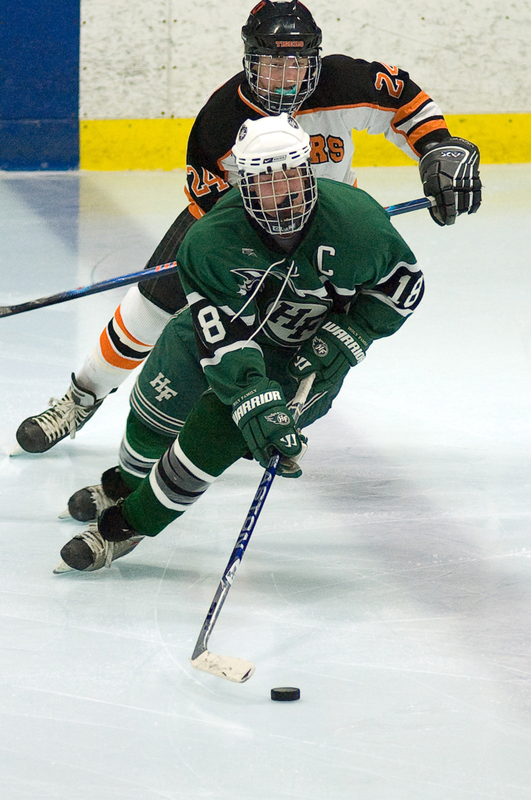 Holy Family had the answer for the question most teams have been asking all season: how do you slow down Delano/Rockford’s Tyler Heinonen? For just the seventh time all season, Heinonen was held without a goal. (Ed. note: Due to a scoring error, Heinonen was not originally credited with two assists. The article has been modified to reflect that fact). 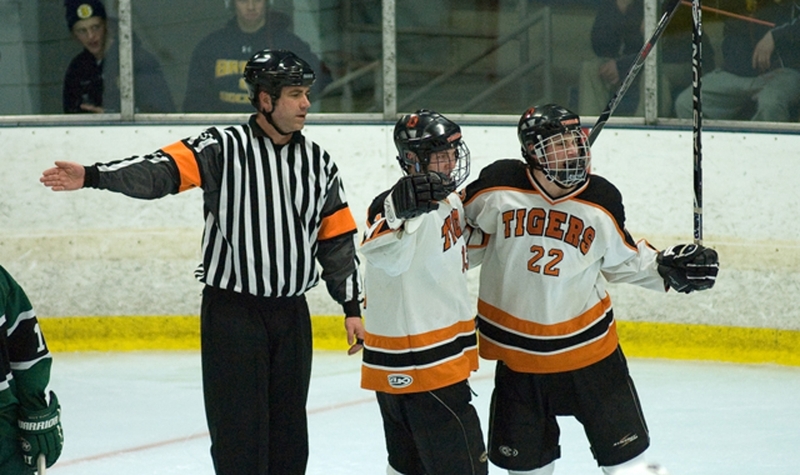 But the second-seeded Tigers (17-7-2) showed they were much more than a one-man show, as six different players scored in a 6-2 Section 2A quarterfinal victory at Parade Ice Garden Friday night, Feb. 26. “You always have to pay attention to him. We didn’t quite shadow him, but we told the boys that whoever was closest had to stay with him,” Holy Family coach Dave Nelson said. 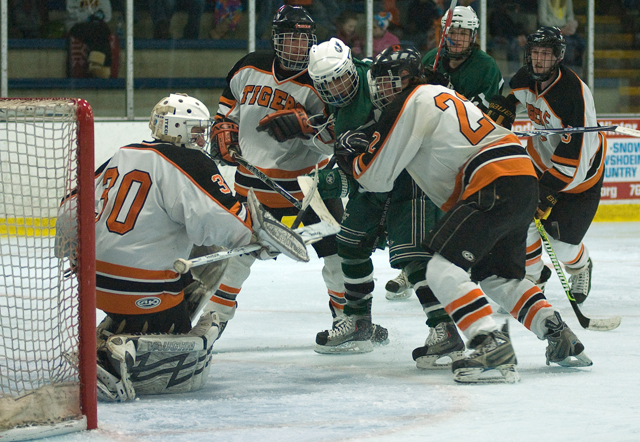 Holy Family (12-14-1) did nearly everything it planned to do in the section quarterfinal – the third meeting this season between the Wright County Conference rivals – all won by the Tigers. The Fire outshot Delano/Rockford (45 shots to 35), held Heinonen off the scoreboard and locked up the Tigers at even strength. But for the third time this year, it wasn’t enough. 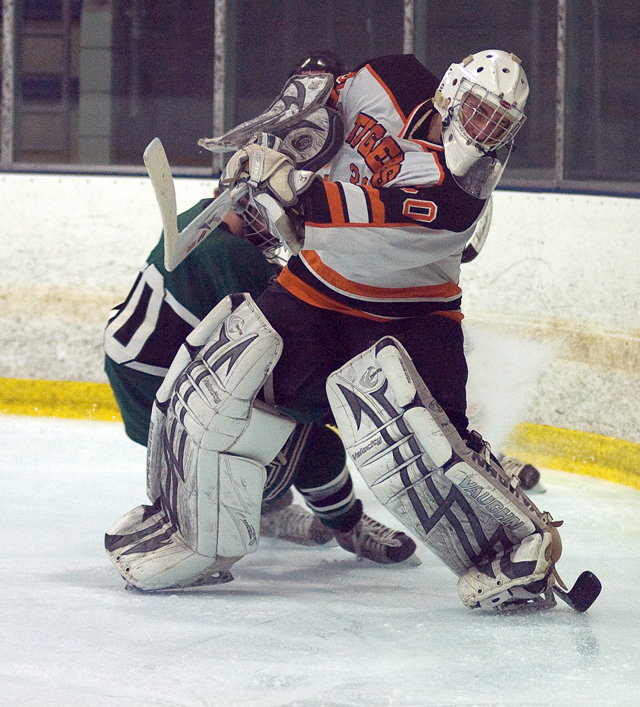 Delano/Rockford scored three goals on the power play in just four chances, ending any hope the Fire had of an upset. Dillon McLain, Bobby Emmer and Ben Ylitalo all tallied power play goals. McLain’s gave the Tigers a 1-0 lead in the first and Emmer’s tied it at 2-all late in the second, but it was Ylitalo’s that was the backbreaker. With just 13 seconds left in the second, he slid the puck past goaltender Matt LaPrade, pushing the lead to 4-2. 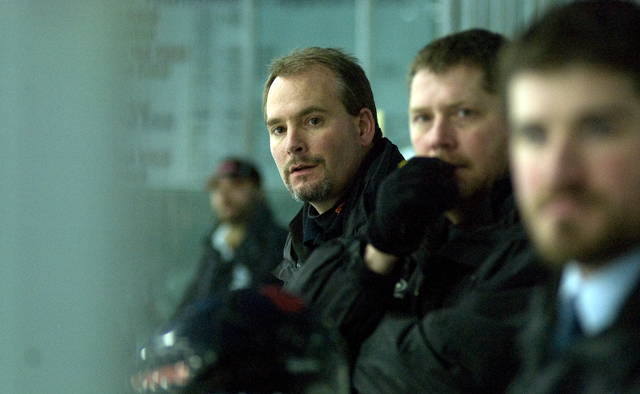 Despite allowing 45 shots on goaltender Jason Dzurik, coach Steve Brown felt the Tigers played nearly flawless defense. “The biggest key was to move it out of the zone as quickly as possible,” agreed defenseman Nick McLain. 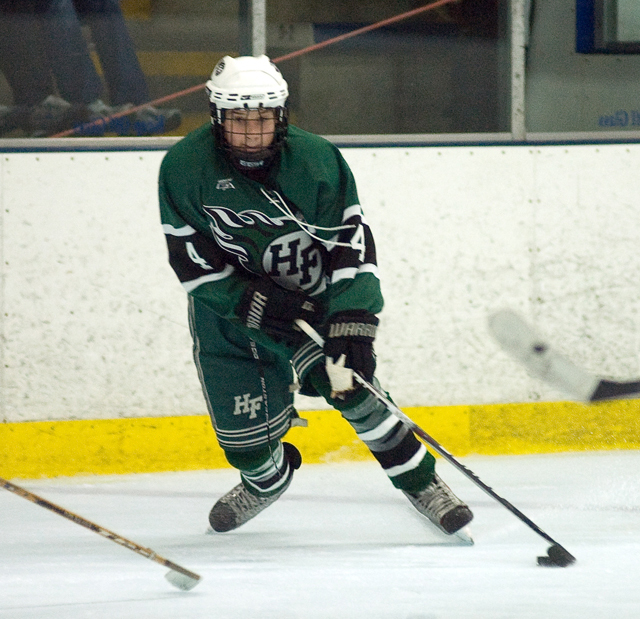 There was only one breakdown, as Holy Family scored two goals 32 seconds apart midway through the second period to take a 2-1 lead. Charlie Donlin tied the game on an unassisted tally at the 7:52 mark, then Charlie McCulloch tipped in the go-ahead goal on the very next shift. 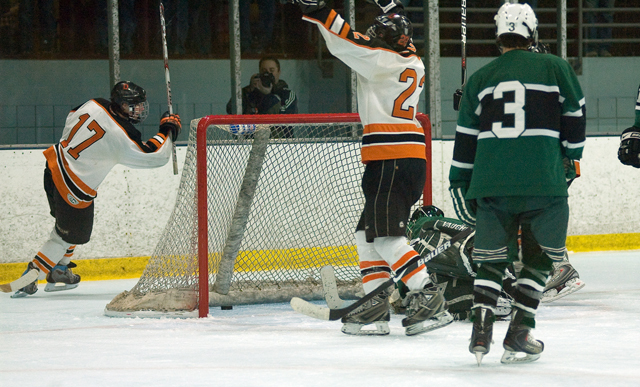 But Delano/Rockford rattled off five straight markers to cruise into the section semifinals. Chaz Heikkila, Jack Emmer and Adam Ernst also scored even-strength goals for the Tigers. 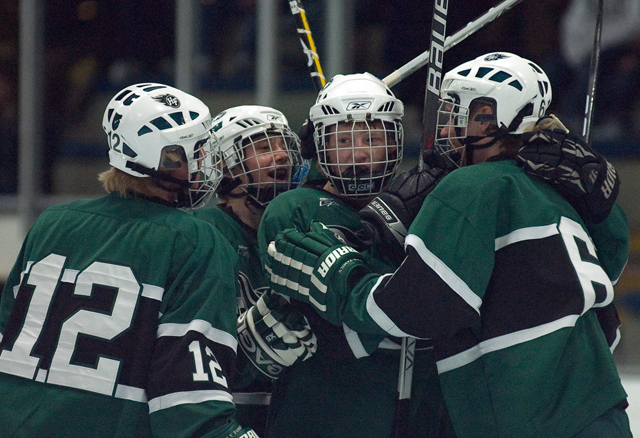 Nick McLain also got involved in the rally, assisting on three of the final five goals. 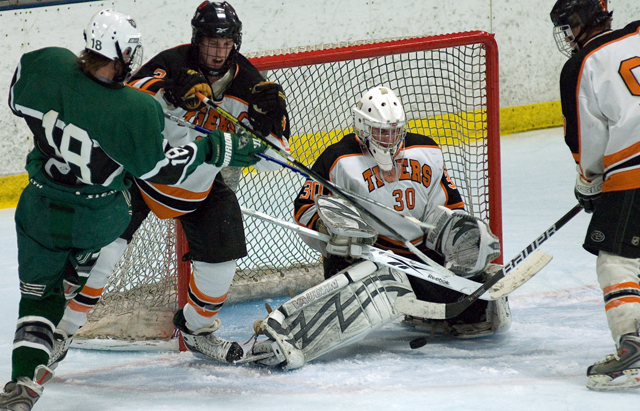 With the victory, the Tigers advance to the Section 2A semifinals Tuesday night against No. 3 Blake. The two teams didn’t play this past season. 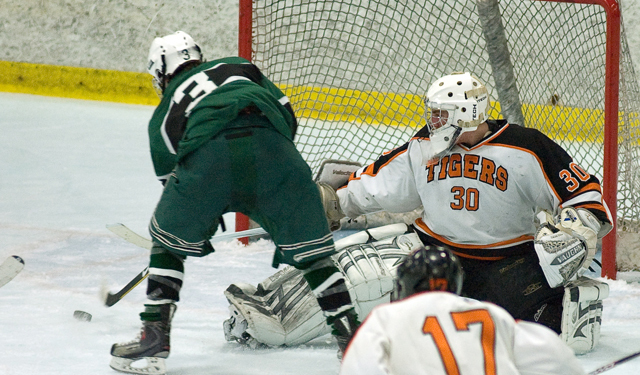 Dzurik, the Tigers’ senior goaltender, stopped 43 of 45 shots in leading his team to victory. 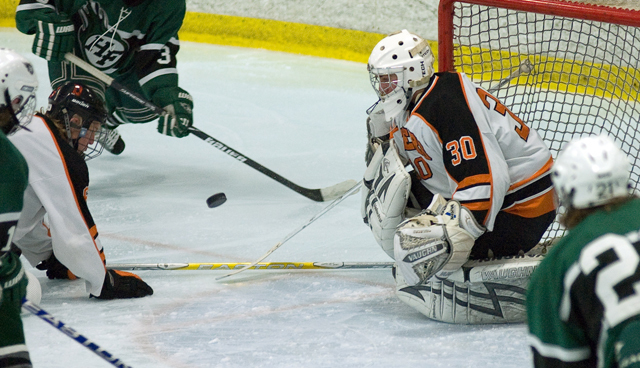 Dzurik rarely faced many rebounds, as his defense was strong in clearing the puck, but he made all the saves he needed. 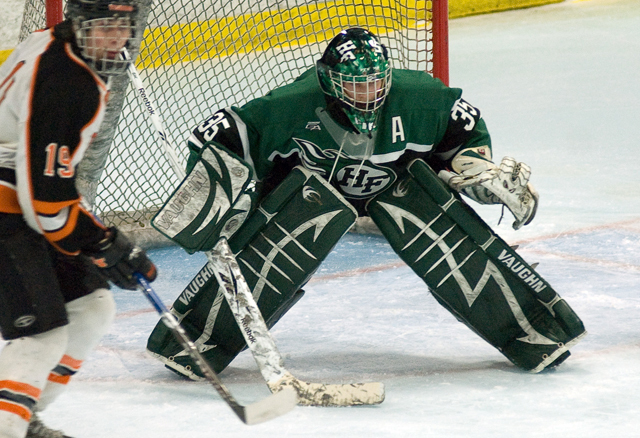 He was especially strong in the third period as the Fire tried to rally, turning aside all 18 shots he faced. 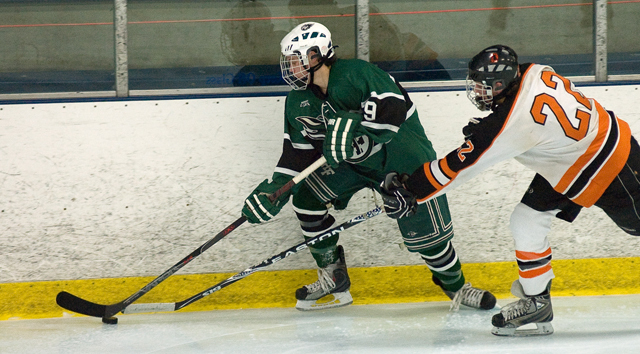 Reisgraf, a junior defenseman, was a whirling dervish from the blue line. 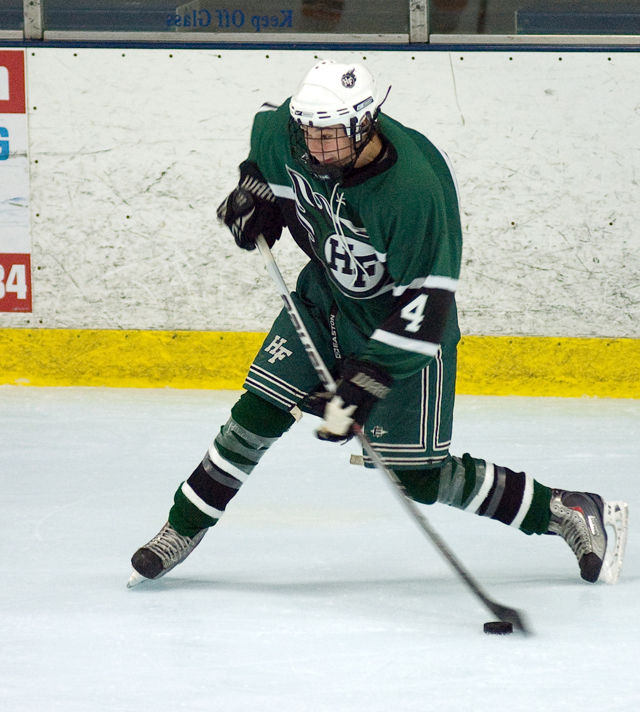 He led many Holy Family attacks with full-ice rushes, weaving his way through the Delano defense. While he finished with just one assist, his impact was felt throughout the game. “He sees the ice and he can handle the puck. He is going to be a prototype defenseman next year, if he isn’t already,” coach Dave Nelson said. 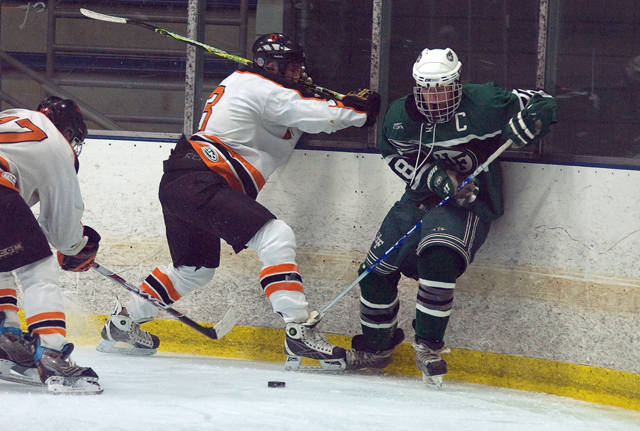 McLain, a senior defenseman, also added plenty of offense from the blue line for Delano/Rockford. While the Fire were focused on stopping sniper Tyler Heinonen, it left more room for players like McLain to operate. He took advantage, assisting on three of the final five goals. His size was also key to clearing the Fire – and the puck -- from in front of Dzurik. 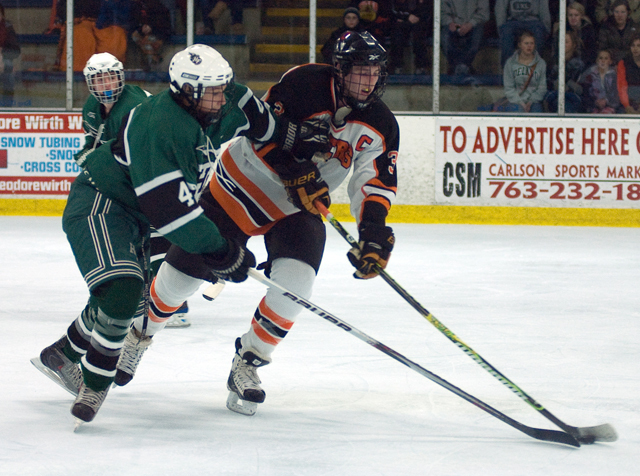 Top-seeded Breck was expected to roll past No. 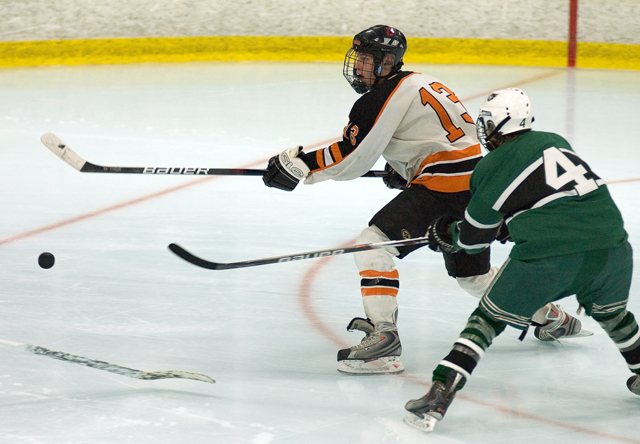 8 St. Louis Park in the other quarterfinal Friday night – and the Mustangs didn’t disappoint. Led by Mike Morin’s hat trick, Breck stampeded to an 8-0 victory.